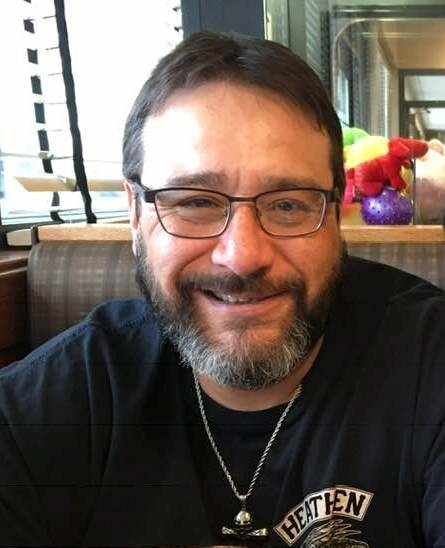 Matthew Shawn McMillan, 48, passed away March 26, 2019 at his home in Winona, MN. Shawn was born in Minneapolis, MN January 14, 1971 to Donna McMillan. He grew up in Waukon, IA where he was raised by his Grandparents, John “Tex” and Ruth Dotseth, as well as his Aunt Mary Anne McMillan Urell for a couple of years. He was currently working through the ORC in Winona at RTP, Montessori, and Peerless as a janitorial/maintenance worker where he had really embraced his jobs, took pride in his work, and earned the respect of his employers and co-workers. Shawn loved three wheeling and dirt bikes when he grew up. He liked racing both and he even took home a trophy or two. He was a fan of going to the car races with his Grandpa and they attended many in the Waukon and LaCrosse/West Salem area. He was a great fan of Harley Davidson motorcycles and you would often see him wearing their t-shirts and hats. He was an outdoorsman who loved to hunt, fish and go morel mushroom hunting. He enjoyed many competitive games of cribbage with his Aunt Mary Anne and shooting a game of pool as well. Shawn had a great sense of humor and a heart of gold, evident to all who truly knew him. He attended church at Pleasant Valley in Winona and had sought a closer relationship with Jesus. Shawn is survived by his fiancé Lois Escho, his mother Donna Gillespie (LaCrosse, WI), sisters Brandy McMillan (Minneapolis, MN) and Deanna Gillespie (Reidsville, NC), one brother Stephen Gillespie(LaCrosse, WI), Grandmother Betty McMillan (Bell Gardens, CA), Aunts Nancy (Russell) Welper (Dorchester, IA), Julie(Steve) Alden (Waukon, IA), and Mary Anne McMillan (Joe) Urell (Fountain City, WI), Uncle David (Kathie) Simon (Bartlesville, OK)seven nieces and nephews and eight cousins. A celebration of life gathering will be held on Saturday, April 13, 4-6 PM at Fawcett Junker Funeral Home in Winona.